On the wedding day, the bride simply glows with happiness. The hair is perfect, the makeup flawless, the gown, jewelry and accessories all picked carefully to be the most flattering. It’s likely that on this one anticipated day, she will probably feel her most beautiful ever! One of our main goals is to make sure the bride has photos where she looks as beautiful as she feels. While for the majority of the day, we are photographing events and moments as they happen in a photojournalistic style without interference, when doing a bridal portrait, we will give some directions. We usually have only a few minutes for photos before the bride heads down the aisle and we want to to maximize the time so we can do a variety of shots - close-ups, waist-up, and full length. Sometimes the slightest angle of the chin or turn of the hip can make all the difference in how the everything looks. We will do all we can to showcase the bride’s best features whether it’s shooting at a shallow depth of field for a closeup to smooth skin and make the eyes pop, using a reflector to eliminate any shadows under the eyes and add some extra sparkle, or demonstrating the trick to look over your shoulder without creating dreaded neck wrinkles! For this portrait, we turned the bride toward the window, used a white reflector to soften the light illuminating her face, and asked her to look down and think about the vows she was about to read. 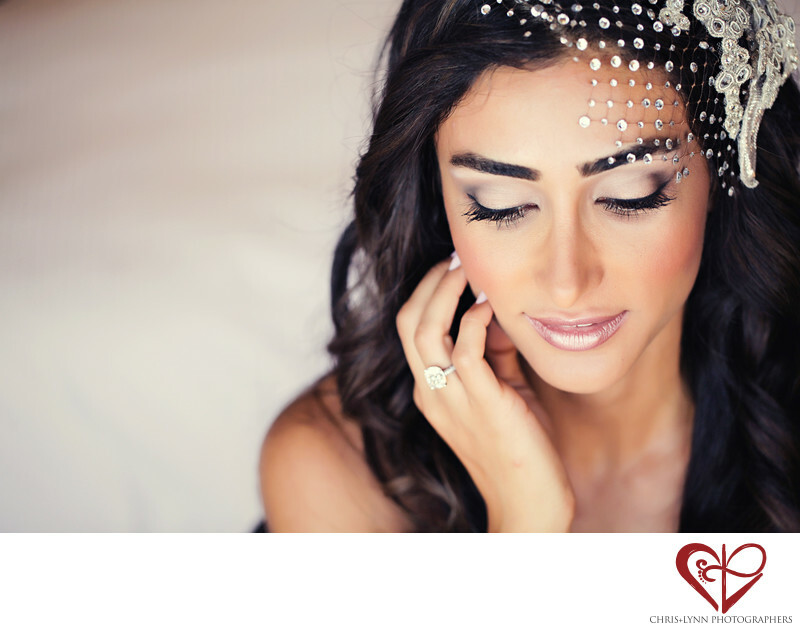 We wanted a uncluttered image so the background is simply the white bedding in the room that fades away and keeps the focus on her delicate jeweled headpiece, her engagement ring, and her beauty.